Whew! Only ten weeks to go until the Inclusive Learning Technologies Conference 2014 (ILT2014) kicks off on 20th May on Queensland’s Gold Coast! If you have registered already, this update is just keeping you in the loop. If you haven’t yet registered, it would be great to have you join us for four full-on days of immersion in the world of technologies to support diverse learners! 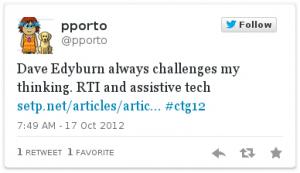 Dr. Dave Edyburn‘s name is synonymous with special education technology research. Along with research looking at technologies supporting struggling students. So we are excited to be hosting his very first visit to Australia to present at this year’s conference! His keynote address “Applying the Research Knowledge Base to Improve Outcomes for Students who Struggle in Reading and Learning” is sure to be provocative. He has a way of presenting this content that is engaging, challenging and thought-provoking. Several of the Spectronics team have seen Dave presenting at conferences in the US over many years. We like his work and his approach … so we thought it was definitely time to share him with you too. The Top 10 reasons to attend the ILT2014 Conference! We appreciate that there are many conferences and workshops vying for your precious Professional Learning budget dollars. So what’s so special about this one? Why should you choose to commit your limited funds to joining us? Click here to download our PDF flyer outlining the TOP TEN REASONS TO ATTEND OUR CONFERENCE. We hope this helps you to present your case for support to be there with us in just 10 short weeks time now! If you need anything else to back you up, let us know and we will see what we can come up with. We are ever flexible here. That’s how we roll! If you are one of the MANY people telling us that they find it handy to have a copy of the full conference program on hand, we now offer two downloadable PDF options for you. The full ILT2014 Conference Program and Presenter Resumes downloadable here. The Conference Program Overview simply providing session titles and presenter names downloadable here. Just a reminder that all program and presenter details are also available on the Conference Program page of the conference website. Session Selections now just TWO WEEKS away | Register soon to be in the first batch of place offers! If you have registered for the conference, you won’t have to wait too much longer to be able to lock in your place at your preferred sessions at the conference. We truly had hoped to have the Session Selections open by now, but we are building a new system to ensure your selections are fully locked in. We still have two more weeks of testing and coding to finalise … so it is REALLY not too much longer for you to wait now! If you haven’t already registered, this is one pretty powerful reason to register NOW, as you will then be one of the first delegates given the opportunity to lock in your personalised program. Making sure you don’t miss out on any session you really want to be a part of! Places will be offered in order of receipt of registrations so the earlier you register … the better your chances of getting into EVERYTHING you want to be a part of! Would it be an Inclusive Learning Technologies Conference without an awesome Closing Session Prize Pool? Never! We are currently busy gathering prizes to be added to the final Prize Pool and will be posting these live to the conference website soon. First up, we have an iPad with a range of ClaroApps including ClaroSpeak, ClaroPDF and ClaroCom generously donated by Claro Software in the UK. Crick Software also have also pledged five awesome bundles of Clicker 6 software and Clicker apps (including Clicker Docs, Clicker Books, Clicker Sentences and Clicker Connect). We are off to a great start! Remember. To be eligible to collect a prize if your name is drawn, you need to be there at the Closing Session in person. So be sure to book your travels home to allow you to be onsite with us for the Closing Session from 2.00pm to 4.00pm on Friday 23rd May. Once again we are very fortunate to have the generous support of Texthelp Systems in Northern Ireland as a Gold Sponsor for this year’s conference. They have offered the fabulous prize of a Samsung Chromebook, with a Read&Write for Google Premium – One Year Single User Subscription AND a Read&Write GOLD Dual Platform for Windows and Mac – P-12 School and Home Site Site Licence (Includes Read&Write 11 Gold for Windows with Australian/UK Voices and Read&Write 5 GOLD for Mac.) Valued at $11,669! This comprehensive package will provide excellent literacy support for ALL students – to use on Mac and Windows computers at your school and in their homes on computers owned by the students for the duration of their attendance at the school. Add in the easy-to-setup-and-use Samsung Chromebook, designed for online access on the move. When combined with Read&Write for Google on the Chromebook, your students are given powerful reading and writing supports accessible within Google Docs, PDFs, ePubs and more, wherever they are working. Details of how to enter the competition to be in the running to win this wonderful prize will be sent in our next email. And will be appearing on the conference website very soon. All you need to do is tell us tell us about your situation and how you would benefit from winning the Texthelp and Chromebook bundle! New for the 2014 conference is the option of Virtual Registrations. As we have shared with you in previous newsletters. In brief, we have contracted the Staging Connections team to professionally record, in full, the 25 “most popular” presentations at the ILT2014 Conference. These recordings will include all six Keynote Presentations, the one-hour ILT2014 Ignite Speed-sharing Session, and two full-day Pre-Conference workshops. These will be posted online for viewing the week immediately after the conference. No waiting around to see what you have missed by not being there for the onsite buzz. All ready to view only days after the live presentations – and for a full 12 months to follow! We are excited to be working with the clever HelpKidzLearn team in the UK to spread the news of this new way of joining us at the conference. This is a great option if you are from outside Australia and wish to be a part of this awesome professional learning opportunity, without having to dig deep to find the dollars for the long trip to Australia! 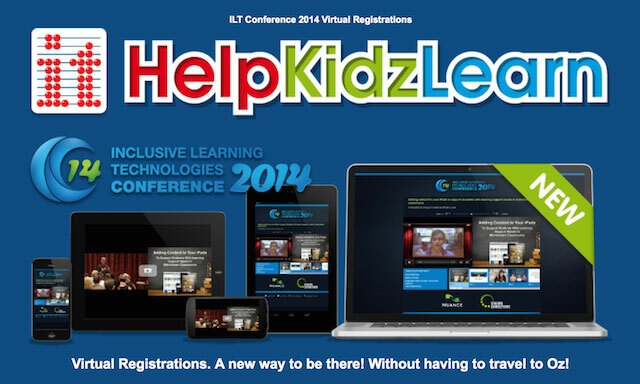 Sign up on the HelpKidzLearn site (offering multiple international currency options) or sign up on the ILT2014 Virtual Registration page in Australia. Whichever works best for you! We have once again negotiated special rates for accommodation onsite at the conference venue (Jupiters Hotel, Gold Coast Queensland) available only to our conference delegates. These rates start at $199 per night and are valid for occupancy on a single, twin or double basis. Making it even cheaper to stay onsite if you are sharing your room with a colleague. All of these rates will be available for 7 days prior to the conference and 7 days after the conference if you wish to extend your stay on the sunny Gold Coast. Apart from the convenience of being right there where all of the conference events and after-hours networking are happening, you will also be given access to free WiFi 24/7. Not only on the conference floor, but in all dining areas of the hotel and back up in your room too. Saving on the standard charge of $25 per day for this service. Visit the accommodation page of the conference website for details of how to book securing this special discounted conference rate! With sincere thanks for the support of our valued sponsors!